I am often asked about the impact of Twitter on my real estate business. With roughly 200,000 "followers" on Twitter, my accounts help bring attention to my Joe Manausa Real Estate office in Tallahassee and I provide some great information on buying a selling a home. And I also publish numerous housing reports (thus the twitter handle @HousingReporter). So how do I use Twitter for real estate and what benefits have I given and received through the Twitter social media tool? 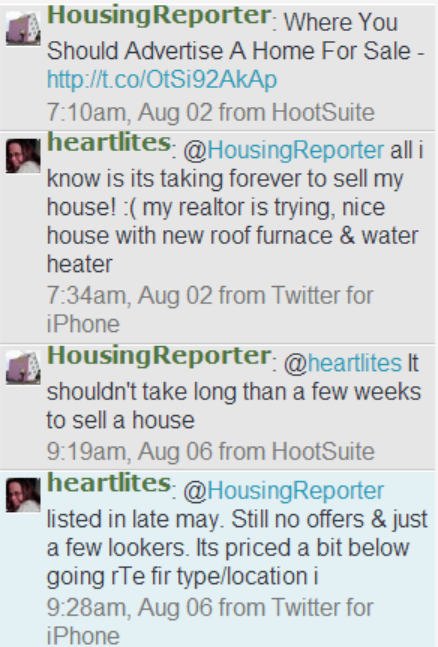 If you don't have and use a Twitter account, then you are probably as ignorant on micro blogging as I was 5 years ago when I first set up @HousingReporter in order to share links to the best housing reports that I could find. Since that time, I can honestly say that a cost-benefit analysis would probably lean to the side of "non profitable," but the intangibles have me confident that Twitter has strengthened my real estate business in Tallahassee. People seeking home selling advice have contacted me from Tallahassee to Tahoe, and that is where I have found the greatest benefit from Twitter. It helps me reach out and help people far beyond the Tallahassee real estate market. Twitter is open (meaning it is not a one-on-one conversation). You can ask a real estate question on Twitter and somebody in the world will answer. Here is a conversation, from Twitter, that happened yesterday. In a nutshell, a twitter member who was trying to sell a home in West Virginia reached out to me through Twitter for advice. Note that grammar is often cropped on Twitter, as each message is limited to 140 characters. So what just happened above? I tweeted a link to a popular article about where you should advertise a home for sale these days. One of my followers responded with the fact that her home was on the market (forever) and not sold. I responded (four days later) with the fact that in most markets, it shouldn't take longer than a few weeks to get sold. She shared more information, and then I was able to give her advice privately on what she should discuss with her agent. Hopefully her interaction on Twitter will help her realize a home sale sooner. With hundreds of thousands of followers, I used to miss a lot of these types of questions, that's why I started using Hootsuite to manage my multiple twitter accounts for real estate. I hope to do a better job interacting with my twitter followers, and I will continue my reports in the future about using Twitter in my real estate business.